I got a short domain recently to spam your Twitter and App.net feeds with interesting things I find throughout the day. Most of the time Buffer and IFTTT get the job done, but whenever I want to shorten a link for private reasons, things get messy. Now I hit a simple shortcut using Keyboard Maestro. One day left to purchase Keyboard Maestro for $19.99 instead of $36, so if I were you I’d better hurry! There’s a token in Keyboard Maestro to collect the current active window in Safari or Chrome. 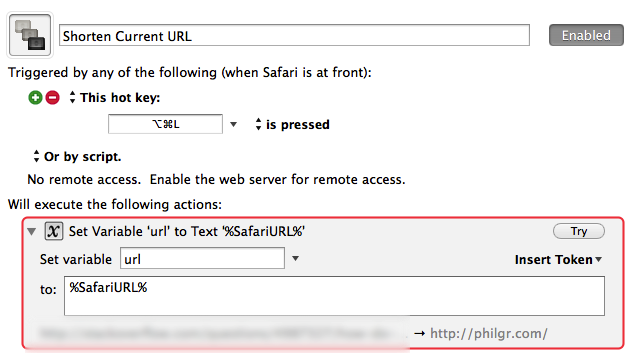 Use %SafariURL% for the first, %ChromeURL% for the latter. We’ll turn that into a variable and call it from a shell script. Place your token where it belongs and remember to set the output to save results to clipboard. I also added a notification to alert me when the action is done. Just set the message to %CurrentClipboard% to get the short link displayed. Two things to notice here if you’re intending to customize Keyboard Maestro using Python. If you use variables, you can grab them by importing the os module and using the following call: os.environ['KMVAR_var’], where var stands for your variable name and KMVAR_ a mandatory prefix. The other thing to point out is what is a python result for Keyboard Maestro, which is whatever you print.